Rachel Ray is supposed to be the cooking icon of the young generation, but I’m still on the fence about many of her recipes. I was given a copy of 2, 4, 6, 8: Great Meals for Couples or Crowds as a Christmas present last year and I’ve perused 30 Minute Meals, but sometimes I think that the recipes are a little needlessly complicated. At least, the recipes I’ve tried in 30 Minute Meals have never been completed in just 30 minutes – but I’d love feedback from others! If someone bought me 2, 4, 6, 8: Great Meals for Couples or Crowds as a beginner book, I’d probably run away and never look back! From what I’ve gathered in conversations with friends over the years, I think a lot of people would like to cook and get more comfortable in the kitchen, but they’re intimidated. They don’t know where to start. Don’t be afraid to start small! 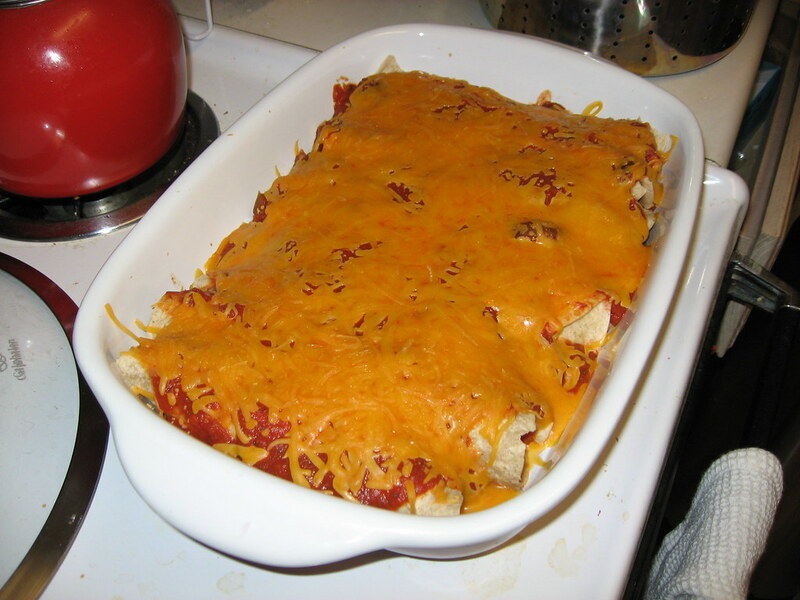 I like recommending Kraft Foods – they have a lot of very simple and quick recipes. They used to offer a free quarterly recipe book and free calendar, but now I believe they’ve switched to online newsletters only. The tiny recipe books at the grocery store checkout counters are also a great way to get your feet wet. But Rachel Ray doesn’t have to be scary to beginner cooks! This week I tried Rachel Ray’s Easy Chicken Enchiladas recipe. 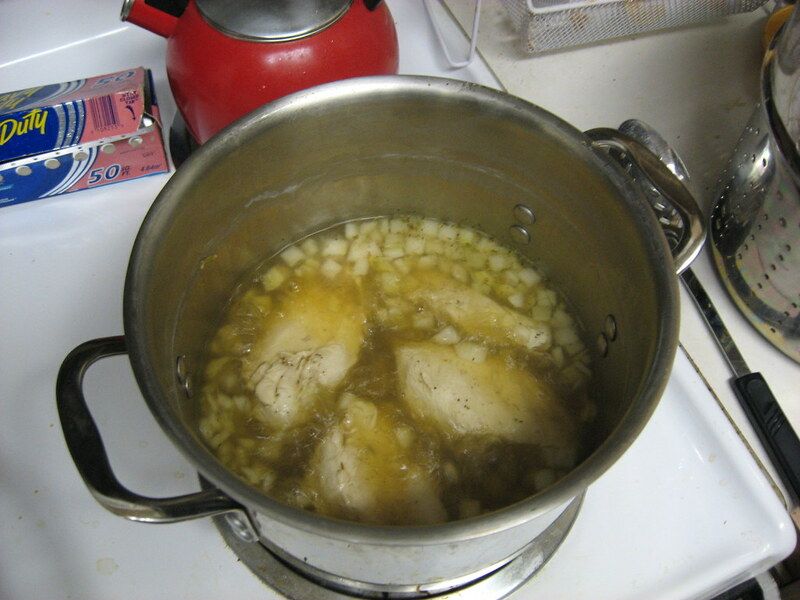 I actually don’t think I’d ever poached chicken before (as the recipe calls for), and I found that it came out a little rubbery or, to use some rather gross imagery, sweaty tasting. The overall flavor of the enchiladas was good; the cinnamon made it taste almost like a simplified and less spicy mole sauce. Let’s lock in our flavor and spices while not making this recipe needlessly complicated. If you have time, marinate your chicken with some of the sauce first. Instead of poaching the chicken, give it a juicier texture by grilling it and then shredding. If you like more punch in your cheese (I do! ), swap the Monterey Jack for a sharp yellow cheddar. Don’t be afraid to go heavy on the spices if you like it hot! If you can, marinade chicken for at least one hour with some of the sauce. 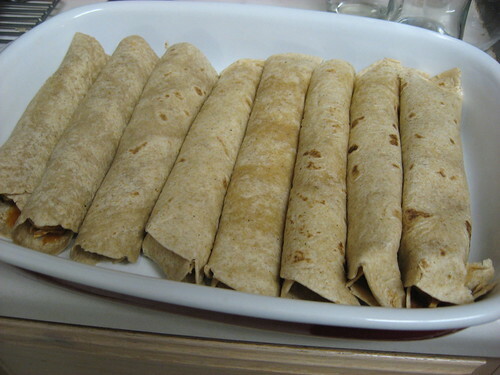 Wrap corn tortillas in foil and warm in the oven. Grill chicken for 10 minutes or until cooked through (bone white). Remove chicken breasts to a bowl and shred with 2 forks. Add tomato paste, spices and salt and work through the chicken using the forks. Combine all sauce ingredients and heat through, keeping warm until needed. Pile chicken mixture into warm corn tortillas and roll. 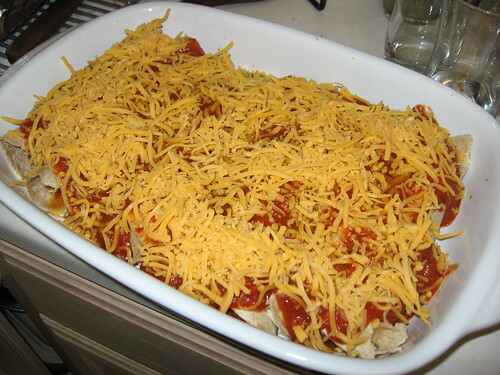 Line casserole or baking dish with enchiladas, seam side down. Pour hot tomato sauce over the chicken enchiladas and top with sharp yellow cheddar cheese. Place in enchiladas in oven 6 inches from broiler and broil 5 minutes to melt cheese and set enchiladas. Enjoy! My favorite Rachael Ray cookbook is her 30 Minute Meals 2. This is the only one that has not just so-called 30-minute recipes, but complete so-called 30-minute meals, i.e. 2-4 recipes that all supposedly get done in 30 minutes, usually including a main and several sides, and sometimes dessert or a cocktail as well. On balance, I’m a fan. It’s true that I’ve never finished one of these in 30 minutes. However, given that I can easily spend 2 hours getting dinner ready, I am happy if I manage to cut the time down to an hour, which Rachael’s menus usually realistically take. But it’s a huge bonus to have the sides and dessert right in there. Flavorwise, I think she usually does a great job telling you how to get a flavorful dish. Not everything I’ve made from her has been a success, but when things succeed they often knock my socks off. Like she had this absolutely fantastic side that involved broiled portobello mushrooms with smoked mozzarella, which was totally unforgettable. True, her recipes involve buying very specific ingredients, and making a colossal mess in the kitchen. So I couldn’t cook that way every night. But it is fun to have a Rachael Ray night every so often. It’s true, I could easily spend 2 hours getting dinner ready as well! I just don’t move that quickly in the kitchen. 🙂 Thanks for the great comment!